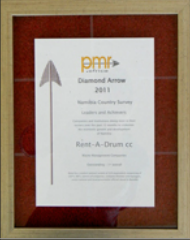 The Value and Purpose of receiving a PMR AWARD. To create a global and unique marketing tool for the company. 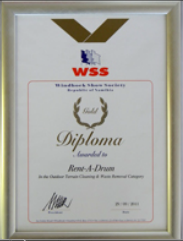 To enhance excellence in the industry. To set a benchmark in the industry. 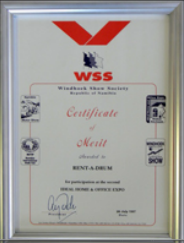 To create recognition towards the company for all their hard work. 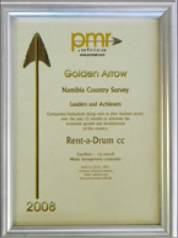 The PMR awards are the culmination of a research process whereby companies are rated based on respondents’ perceptions with a strong focus on evaluating and measuring customer service and customer satisfaction. 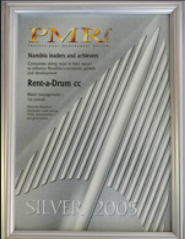 Receiving the PMR Award represents competitiveness, effectiveness, excellence and leadership. 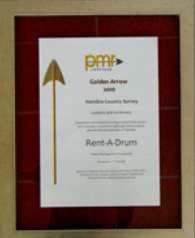 On behalf of Rent-A-Drum, we want to congratulate every employee for receiving a PMR Award every year for Waste Management in Namibia. 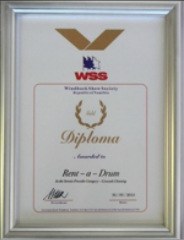 Rent-A-Drum wish to congratulate you for achieving this amazing award! 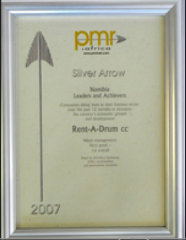 After all there is a successful team behind each successful and highly rated company. 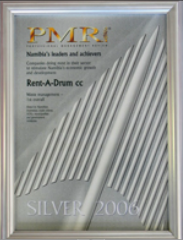 Without your hard work Rent-A-Drum will not be able to be the leading organization in what we do. Keep up the great work and remember the sky is the limit!